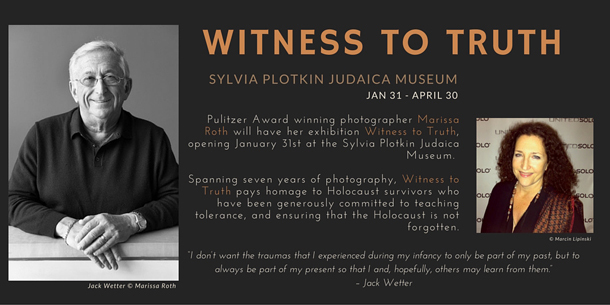 Congregation Beth Israel’s Plotkin Judaica Museum is pleased to present “Witness to Truth”, portraits of Holocaust survivors by Marissa Roth, opening on Sunday, January 31st at 2:00 pm. This exhibit, curated by Jan Belin, coincides with International Holocaust Remembrance Day which is observed on January 27th. Please help spread the word about this important event taking place in Scottsdale, Arizona and we hope to see you there.